With the excitement of a pre-pubescent child about to venture his first journey thru the gates of Disneyland, we unloaded our gear, set up our testing area and stuffed empty magazines to capacity with the Underwood 115 grain +P+ 9mm ammo. With a claimed velocity of 1400 ft/sec on the box, it is pretty safe to say we were eager to begin our testing. 115 grains launched @1400 ft/sec translates to 501 ft/lbs of energy. For those taking notes, Yes.. that is 357SIG performance. For the heart of these high velocity cartridges, you actually have a choice. Underwood has equipped them with both Speer Gold Dot, or Golden Saber Hollow Points. Either is a good choice in my opinion and both are favorites amongst enthusiasts. For our testing we are using the Gold Dots. We weighed our options for firearms available to us, and decided that we would use 3 different firearms to launch the 9mm rounds. The ever popular, Ruger LC9 for Sub-Compact crew, the military's Beretta 92A1 for the full size folk, and the SIG PRO for those in between. We initialized this review with a simple penetration test using the mid-length barrel of the SIG PRO. We used every day milk jugs filled with water as that is a pretty common medium. Of the shots we fired, all had about the same result. The 115gr. would penetrate completely thru all three jugs, but stick in the back wall of the third. Subsequent shots fired from the Beretta 92A1 and Ruger LC9 produced the same results. One round made it partially out of the third jug, (using the M9) but not entirely, so we are going to give the Underwood 9mm 115gr. +P+ a water jug penetration score of 18" or 3 jugs. With the Underwood 124 +P+ ammo Penetration was a bit greater. When we used the SigPro or the M9 we could get rounds into the 4th jug. They were stuck in the wall but did penetrate the 4th jug enough that is would leak out water. We recovered the bullets and measured several for expansion. Regardless of the firearm used, each hollow point consistently expanded somewhere between .864 to .89 of an inch. The 124 gr. seemed to be on the smaller end, and the 115gr. on the larger end. That is about 2.5X the original size. Pretty impressive for a bullet that starts out .355". Next we placed the recovered projectiles on our scale. The retained weight of each bullet was 114.5 grains and 123.2 grains +(-) a tenth. Clearly these Gold DotHollow Points perform quite well at these velocities. Their weight is retained and the bullet stays together. The flower they make is quite impressive as well. Still in awe over the bullet expansion and a bit giddy from the jug assasination, we shifted gears and put a few rounds thru the chronograph. Listed below are the recorded results from each firearm. Shot 5: 1422 ft/sec. Muzzle Velocity = 1421 ft/sec. Muzzle energy = 516 ft·lb Shot 1: 1310 ft/sec. Shot 5: 1306 ft/sec. Muzzle Velocity = 1312 ft/sec. Average velocity for the Underwood 115gr. 9mm +P+ using the SIG PRO (3.86 inch barrel) was 1421 ft/sec. When using a 115gr. projectile, that translates to 516 ft·lb of muzzle energy which penetrates 18" in water jugs and expands to .88". WOW, not only is that a mouthful, it is also very impressive! For those curious, 18" in water would be approx. 9" in ballistic gelatin. 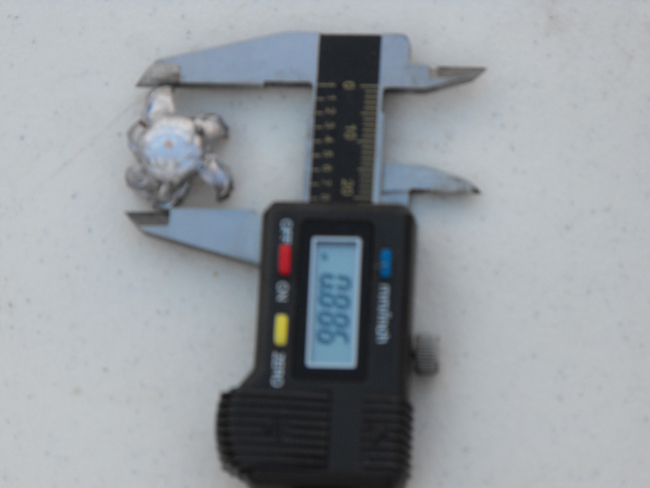 For further comparison, Speer's Gold Dot 115gr 9mm loads move at 1210 ft/sec. producing 374 ft·lb of muzzle energy. That's not even close to the Underwood load. However, the Speer Gold Dot 125gr. 357SIG loads produce 506 ft·lb of muzzle energy. Okay,.. now we are getting somewhere, BUT... these 9mm's still surpass it, and from a 3.86" barrel! Underwood, you now have our full attention. Is it just me, or is everyone very curious to see the speeds thru the 5" Beretta? In theory, the longer barrel should produce even greater velocities. For now lets move on to the smaller LC9, and save the best for last. Shot 5: 1358 ft/sec. Muzzle Velocity = 1352 ft/sec. 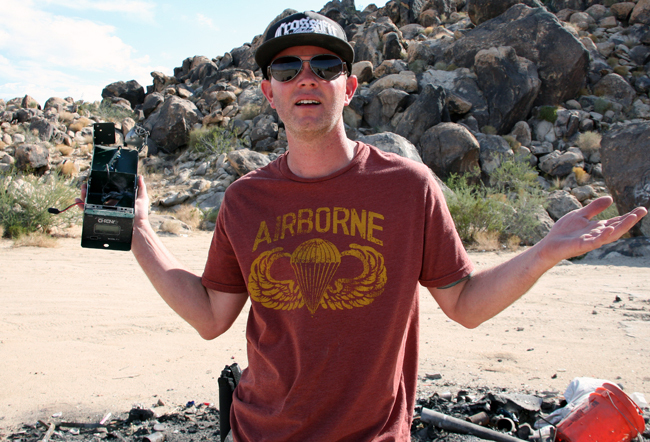 Muzzle energy = 467 ft·lb Shot 1: 1241 ft/sec. Muzzle Velocity = 1260 ft/sec. Shot 4: So this is where the test takes a turn for the worst. Amongst the excitement and data recording, we failed to pay much attention to the actual chronograph. You see, there was a small amount of wind somewhere in the equation, divided by the square root of an improperly secured chronograph, which caused our LC9 shooter to infuse our chrony with, .. well... (according to the numbers we recorded) 438 ft·lb of muzzle energy. While I am no mathematician, I think that was about 437.5 ft·lb to much for it.Then again, perhaps it had something to do with alwaysstanding in the line of fire. Poor guy just couldn't handle the stress, and bid his final farewell reading, before jumping in front of the Underwood Ammo to prove it's effectiveness? Either that was the most loyal chronograph we will ever own, or it was fooling around with the shooter's woman. You decide. Rest assured, we did have a moment of silence and a proper burial for our fallen comrade. It was a good run ol' friend. May you rest in peace. With the the recorded speeds using the LC9 (3.1" barrel) the average was 1352 ft/sec. When using a 115gr. projectile that translates to 467 ft·lb of muzzle energy. That is one hell of a whallop from a pocket gun. With the three shots we were able to land thru the chronograph, the 124gr. average is 1260ft/sec which creates 438 ft/lbs of muzzle energy. With the shots at milk jugs and recovered bullets, we learned the penetration and expansion from this firearm was roughly the same as with the SIG PRO. It would be between .87-.89 of an inch and it could penetrate all the way to the end of the third jug. Impressive indeed. Last but not least, we learned that if a rabid chronograph attempts to break into your home, the Underwood Ammo is certainly capable of stopping it. Of any of the firearms used so far, all the ammo fed and functioned properly. There were absolutely Zero malfunctions or failures to fire. We are also happy to report that shortly after our tragic loss, our friends at David Colucci Plumbing of Yucca Valley purchased and donated a new one to us. We will have our new tool delivered in 2 weeks so that our review may commence. Before this review is complete we will also have results for Underwoods 9mm 124gr +P+. I cross my fingers that our new chronograph can handle the stress. I am sure it is not easy to perform your duties and maintain composure with bullets whizzing past your head, but neither is it easy to work with a suicidal chronograph. After introductions to features and controls of our new member Moses, and a few test fires to check his calibration, we loaded a half mag of Underwoods 115 Grain 9mm and finished it with 124 Grain in our 5" Beretta 92A1. Our recorded speeds are as follows. Shot 5: 1468 ft/sec. Muzzle Velocity = 1458 ft/sec. Muzzle energy = 545 ft·lb Shot 1: 1424 ft/sec. When people ask which barrel length they should get, my question is always, "For what purpose?" Yes a longer barrel will be harder to conceal, so that would rule out a 5". But if you are not trying to conceal, using it for target shooting or as a hunting sidearm, the longer barrel will really shine. Here is how the M9 did on paper. The average velocity was 1458 ft/sec. which translates into 545 ft/lbs of muzzle energy. Penetration is slightly greater with this round as it would stick in the wall of the third jug, not just mark it as it did with the shorter barrel pistols. I am impressed, no...I am very impressed. This is great ammo, hands down. The problem is, high quality ammo is expensive to practice with. Well, in case I forgot to mention, and I did, Underwood Ammo is about half the cost of its' competetitors. Underwood Ammo is packaged in 50 round boxes at the same price their competitors sell 20. This means for every box of Underwood purchased, 30 extras are included to launch down the range. Not a bad deal. Regardless of which pistol you use, Underwood has created a winner. Either one of these Underwood 9mm loads is great selection for a defensive load. It is accurate, affordable, expansion is awesome and it packs 357SIG punch. 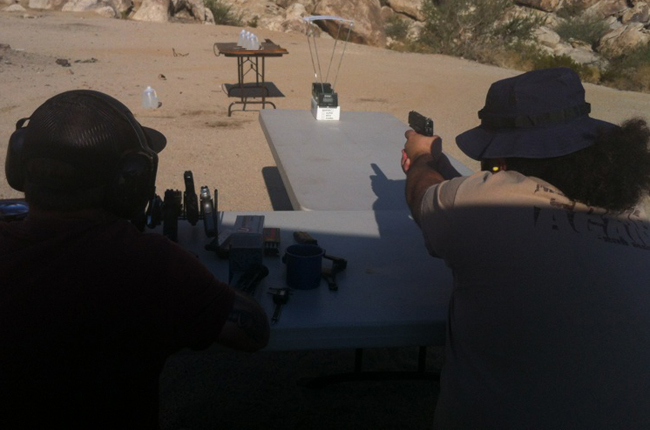 Yet, even at these speeds, the firearm is easily controlled and follow-up shots find target with little effort. A job well done Underwood. Kudos! 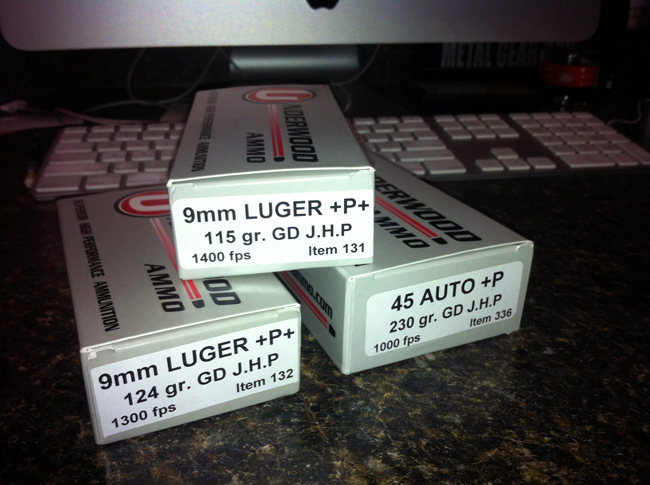 You can purchase Underwood 115 grain +P+ 9mm ammo directly from Underwood here. You can purchase Underwood 124 grain +P+ 9mm ammo directly from Underwood here.